This bibliography lists publications on the current research into Robert Brown andBrownian Movement. Turn to the next page to see Brown's own microscope - and see what he could see almost two centuries ago. Announcement, 1981, Robert Brown and the Discovery of theNucleus, Linnean Society Circular: 32, 28 May. BJF, 1981, Three Simple Microscopes by Bancks of London[report of demonstration], Quekett Microscopical ClubNewsletter, 20: 6a. BJF, 1981, Robert Brown and the Discovery of the Nucleus,a lecture-demonstration, Linnean Society, 5 November. Knox, Peter, 1981, Ancient Lens (report of BJF research, withphotograph), Observer Colour Magazine: 27, 22 November. Report, 1982, [in] Record of Proceedings, BiologicalJournal of the Linnean Society of London, 18 (4): 404. BJF, 1982, The Nucleus and the Simple Microscope, Journalof Biological Education, 16 (4): 281-285. BJF, 1982, Revelation and the Single Lens, British MedicalJournal, 285: 1822-1824 (reprinted as pp 1-7),December. BJF, 1983, The Restoration of Browns First BotanicalMicroscope, [leading paper] Microscopy, 34, (6):406-418. BJF, 1984, New Light on the Origins of BiologicalMicroscopy, presentation at Royal Society Conversazione, 10May. Report, 1984, The Origins of Biological Microscopy, Catalogueof Exhibits, Royal Society Soirée, 21 June. Poster, 1984, Discovery and the Simple Microscope: Brian JFord to lecture on 10 November, Special Lecture Programme, London:Natural History Museum, October. BJF, 1984, Discovery and the Simple Microscope, SpecialPublic Lecture, Natural History Museum, 1500h, 10 November. Report, 1985, Browns Microscope [reference in] TheLinnean, 1, (4): 1. BJF, 1985, The Microscope of Robert Brown, The Linnean: 1(4): 12-17. BJF, 1985, Single Lens, Story of the Simple Microscope,ISBN 0-434-26844-5 182 pp, London: Heinemann. Van Kasteren, Hoost, 1985, Het beste ergrootglas (review ofSingle Lens), NRC Handelsblad, 7 March. Spencer, Lloyd, 1985, Taking a closer Look (review of SingleLens), New Scientist; 38, 7 March. Simms, Tom, 1985, Review of Single Lens, Tom SimmsInternational News Agency [report], March. Bradbury, S., 1985, Objects of Curiosity (on Single Lens), TimesHigher Education Supplement, 7 March. Schuuring, Casper, 1985, Microscopisch Speurwerk, (review ofSingle Lens), Intermediair, 21, (14): 45, 55, 5April. Report, 1985, Speuren met oude spullen, Logboek van deWetenschap, Eindhovens Dagblad: 11, 12 April. Schuuring, Caspar, 1985, Speurtocht naar erfenis, BrabantsDagblad: 25, [with pictures], 13 April. Evennett, Peter, 1985, Nature Magnified (review of SingleLens), Nature: 695-696, 25 April. BJF, 1985, Single Lens, the Story of the Simple Microscope,[US Edition] ISBN 0-06-015-366-0, 182 pp, New York: Harper &Row, April. Baily, Ronald, 1985, The Beginnings of the Microscope (reviewof Single Lens, with illustrations), Washington TimesMagazine, USA, 29 April. Turner, G. IE., 1985, review of Single Lens, BritishBook News, 502: 82, May. Anon, 1985, review of Single Lens [in] The Irish Times,4 May. Announcement, 1985, Single Lens [in] Science News USA 127:322, 24 May. Lacey, A. J., 1985, Review of Single Lens [in] Proceedings,Royal Microscopical Society, 20, (4): 181-2, July. Morrison, Phillip, 1985, Review of Single Lens [in] ScientificAmerican, 253, (1): 27-29, July. Anon, 1985, Review of Single Lens, ArtScene, RidgewoodTimes, USA, 12, 11 July. Award, 1985, Technical Category Photomicrographs taken withBrowns botanical microscope, Annual InternationalPhotographic Competition, London: Institute of ScienceTechnology, Autumn. McCrone, Walter, 1985, [editor] review of Single Lens, TheMicroscope: 33, (4): 303-305. BJF, 1986, [Japanese edition] Single Lens, the Story of theSimple Microscope, Tokyo: Hosei University Press. Poster, 1986, BJFand the Early Days of Microscopy, InauguralScience Night At The Savage Club, 14 March. Brown, Olivia, 1986, [cites Brian J. Fords Single Lens,q.v., [in] Catalogue 7 - Microscopes, CambridgeUniversity: Whipple Museum. S[hirley] A. R[oe], 1986, [Review] Single Lens: The Story ofthe Simple Microscope, Journal for the History of Biology,19 (2): 320-321, Summer. BJF, 1986, [preprint summary] The Real History of theMicroscope, Inter Micro 86, McCormick Center, Chicago, July. Cooke, Peter, 1986, Review Of Single Lens [in] AnalyticalChemistry, 58: 1926 (36-37). Gregory, Richard, 1986, [review of Single Lens], Story of theSimple Microscope, Inter-Disciplinary Science Reviews, 11(3): 318-319. Anon, 1986, review of Single Lens [in] Microscopy, 35:483, July-December. Wilson, J. R., 1986, Frits Noteboom writes on Brian J Ford,[in] Microscopy, 35: 484. BJF, 1987, The [Linnean] Societys OtherTreasures, Linnean, 3 (1): 24-26 January1987. Gardiner, Brian, 1987, [reports] Brian J Ford presentation atLinnean Society Conversazione, Linnean, 3 (1): 32,January. Yonemura, Mr & Mrs, 1987, Brian J Ford cited in paper onsimple microscopes, Japan, 28 March, [published May]. BJF, 1987, The Orchids Rôle in Modern Cell Theory, AmericanOrchid Society Bulletin [with colour Pictures], 56 (II):1164-1167, November. Russell, Nick, 1988, [reports] Brian J Fords inaugurallecture, Hidden History of the Microscope, Biology History,1 (1): 5-6, April. Gage, A. T. & Stearn, W. T., 1988, A BicentenaryHistory of the Linnean Society: 139, (refers to CommemorativeLecture-demonstration on Robert Browns Microscope), London:Academic Press. BJF 1988, Micrograph of TS Cycas imaged with RobertBrown lens [in] Equinox, Great Scientists, May. BJF, 1988 Lecture at inter Micro 88: An Evening with BrianJ Ford - The Natural History of the Lens, 27 June, McCormickCenter, Chicago. McCrone W., 1989, [reports] BJF paper to Inter Micro 88, LifeHistory of the Lens, The Microscope, 36 (4): 232, 1988. BJF, 1989, The Botanic Microscope of George Bentham,Microscopy, 36: 210-215. BJF, 1989, A New History of the Microscope [lectureprogramme], Linnean Society, Burlington House August. Announcement, 1989, A New History of the Microscope, withabstract, The Linnean, 5 (3): 15, August. BJF, 1989, The Survey of Microscopes and Memorabilia, TheLinnean, 5 (3): 31-33; see also Lecture, p 43, August. Announcement, 1989, Brian J Ford to speak at PacificConference, American Chemical Society, Autumn Programme. BJF, 1989, Reappraising the Origins of Microscopy [with colourillustrations], Leading Paper, Microscopy and Analysis, 13:7-10, September. Announcement, 1989, Brian J Ford to Lecture at Fall Meeting,Appalachian Microscopical Society, September. Poster, 1989, Brian J Ford Guest Speaker at Clemson University, September. BJF, 1989, Image Quality in Early Analytical Microscopy [lecture],American Chemical Society Meeting, Pasadena, California, 19October. BJF, 1989, The Early History of the Optical Microscope [lecture],Appalachian Microscopical Society Meeting at Charleston, SouthCarolina, 20 October. BJF, 1989, A New History of the Microscope [lecturedemonstration], Linnean Society, Burlington House, 2 November. Highfield, R., 1989, 1600 Microscope as Good as Modern One[with picture], Daily Telegraph: 7, 3 November. Holland, J., 1989, [Cites BJF in] Microscopes andMicroscopy, Sydney: Macleay Museum. BJF, 1990, The Single Lens Microscope, [in] Landmark Discoveries in the Natural World, Natural History Museum,27 April. Report, 1990, BJFs Brownian Movement lecture, TheLinnean, 6 (2): 2. Cooke, Peter, 1990, cites Brian J Ford on Brownian Movement[in] Review of Microscopy, Analytical Chemistry, 62: R423. Phinney, Harry, 1990, [discussed Single Lens in] RevisionistHistory of Microscopical Sciences, Journal of Microscopy, 159(2): 125-132, August. BJF, 1990, 28th Humphrey Lecture - Living with Microscopes,Northampton Natural History Society, 1930h, 24 November. BJF, 1991, Paper - Robert Brown and Brownian Movement, aDefense, 23 August. Inter Micro 91, Chicago, Illinois. Cadée, G. C., 1991, Brownian Emotion [cites BJF], Nature, 354:180, 21 November. BJF, 1991, Robert Brown, Brownian Movement, and Teethmarks onthe Hatbrim, [leading paper, transcript of extemporised lecture],The Microscope, 39 (3/4): 161-173. [Cadée, G. C.], 1991, Robert Brown zag Brownse bewebening weldegelijte, Wetenschap & Onderwijs, NRC Handelsblad, 12December. Morrison, Philip, 1992, Through a Simple Lens [review ofLeeuwenhoek Legacy, q.v.,] Scientific American, 266 (2):118-119 (USA edition), [and] Scientific American, 266 (2):25 (European edition), February. Bown, William, 1992, Brownian Motion sparks renewed debate[illustrated report], New Scientist, 133 (1808):25, 15 February. BJF, 1992, The Controversy over Robert Brown and BrownianMovement, Biologist, 39 (3): 82-83, June. BJF, 1992, [lectures] An Evening with Brian - The Proof ofBrownian Movement (2000h, 13 July) Inter Micro 92, McCormickCenter, Chicago, Illinois. Peterson, Ivars, 1992, Browns BrownianMovement revisited, [illustrated report], Science News,(USA), 142 (7): 109, 15 August. Wheatley, Denys, 1992, Brown Motionless [correspondence], Biologist,39 (4): 124. [Gibbs, Waite], 1992, Brownian Emotion, [report], Economist:118, 3 October. BJF, 1992, How Brown saw Brownian Movement [presentation]Regional AGM, Institute of Biology, Cambridge, 7 November. BJF, 1992, La Naissance de la Microscopie [lead article, withillustrations in colour], Paris: La Recherche , 23 (249):1370-1378, Decembre. McCrone, Walter, 1992 [reports on] Inter Micro 92: An Evening with Brian: the Proof of Brownian Movement, [in] The Microscope, 40 (3): 181-182, December. Illman, John, 1992, [quotes BJF, Revelation and the SingleLens, British Medical Journal, 285: 1822-1824,December] The Mad Hatter and Arctic Willy, Health: 17, The Guardian, 29 December. BJF, 1992, Brownian Movement in Clarkia pollen: a Reprise ofthe First Observations, The Microscope, 40 (4):235-241. Cooke, Peter, 1992, cites Brian J Ford work on Robert brown[in] Review of Microscopy, Analytical Chemistry, 64: R219-220,R222. BJF, 1993, El Nacimiento de la Microscopia, MundoCientifico, 132: 116-124, February. BJF, 1993, How Brown Viewed Brownian Movement, LaboratoryNews, 497: 12, March. Marsden, J., 1993, (editor) Conversazione Programme [includesBJF Robert Brown video] London: Linnean Society, 20 May. BJF, 1993, Early Images of Science (illustrated with colourmicrographs), Microscopy & Image Analysis [supplementto] Laboratory News: 8, June. BJF, 1993, Robert Browns Observations of Brownian Movement [presentation with videomicrographs] at Conversazione, Chelsea Physic Garden, London: Linnean Society,2030h, 16 June. Announcement, 1993, BJF to lecture at British Museum, London: TheTimes, Todays Events and otherpublications, 1 July. BJF, 1993, Aspects of the History of ScientificIllustration [a slide lecture], London: British Museum,1800h, 1 July. Martin, L. V., 1993, Brownian Motion and Robert BrownsPriority [discusses BJFs research], Proceedings of the Royal Microscopical Society, 28 (3): 143-144, July. BJF, 1993, Brownse Bevegelser og de Første Mikroskoper, Oslo:Naturen, 5: 214-221, August. Announcement, 1993, BJF Brownian Movement Overallfirst prize-winner in Institute of Science Technology Competition, London: Earls Court, 6 October. BJF, 1993, What exactly did Brown see? Biologist, 40,(5): 192, November. Overton, Marianne, 1993, BJF to lecture on The Banks Expeditions - the Dawning era of Microscopy, Institute of Biology, East Midlands Newsletter: 2, November. Report, 1993, Ford brings Brown to Life (with colourillustration), Microscopy News, 1: 1, [distributed with Laboratory News, 506] December. Silver, Sue, 1994, Institute of Biology Stand a great success at Lab-Ex, (includes report of Brian J Ford with Brown and Leeuwenhoek micrographs, etc., at Laboratory Exhibition, with photograph), Biologist, 41 (1): 45, February. BJF, 1994, The Pioneer Microscopists View of Biology (poster presentation, reprint on file), London: The Linnean Society Conversazione, 15 June, 1930h. See also ConversazioneProgramme: 8, June. Daerr, Nancy, 1994, Brian J Ford to lecture at Inter Micro 94:An Evening with Brian and The Shape of Things Past - Brownian Puzzlement, 18-19 July. Symposium Program, Chicago: McCrone Research, June. i: An Evening with Brian, 2000h, 18 July. ii: The Shape of Things Past - Brownian Motion, the Third Movement, presentation of Brownian Puzzlement video, 2030h, 19 July. Chicago: McCrone Research Institute. Sander, K, 1994, An American in Paris and the Origins of the stereo microscope, Rouxs Archives of Developmental Biology, 203 (5): 235-242, 'According to the expert opinion of Brian Ford, these [microscopes] owe their invention directly to Henry Bakers need for a better view of hispolypes.' [cites Single Lens, q.v.]. Cooke, P. M., 1994, Chemical Microscopy, Analytical Chemistry, 66 (12): R558-594, 'Ford recreated [RobertBrowns] observations on Clarkia pollen with modern videomicrographs using Browns original microscope. He proved, once again, that what is now simply called Brownian Movement was  unmistakably discernible to Brown ... [cites BJF in Microscope, 40 (4): 235-241 (1992)]. Rochow, V., 1995, Introduction to Microscopy by Means of Light, Electrons, X-Rays, or Acoustics, 2nd edn., New York.Cites BJFs Leeuwenhoek and Brown research. Magner, Lois, 1995, discusses BJF research on early microscopy [in] A History ofthe Life Sciences: 152-154, New York: Marcel Dekker Inc.
BJF, 1995, Where modern science didn't come from [address], Institute of Biology annual regional dinner at Trent College, Nottingham, 20 January. Meyer, Klaus, 1995, discusses BJF research on early microscopy [in] Die suche nach Leeuwenhoeks Arbeitsmikroskop [from] Die Gemeiniße des Antoni van Leeuwenhoek, Soest, February. Raven, P. H., and Johnson, B. B., 1995, Pictures of early microscopes and specimen [in] Understanding Biology: 65, 3rd edition, Boston: Wm.C. Brown Publishers. Kleinsmith, Lewis & Kish, Valerie, 1995, Principle of Cell and Molecular Biology2nd edition: 4, New York: HarperCollins. Hershey, Erica, 1995, Microscope-maker discovers tiny animals (cites BJF and Single Lens), Susquehana Times and Magazine Old News: 4-5, July-August. BJF, 1995, First Steps in Experimental Microscopy, The Microscope, 43 (2):47-57, plus cover illustration. BJF, 1995, Charles Darwin and the Microscope, illustrated lecture, Darwin at Downe, History Sector of the Institute of Biology, 1600h, 9 September. BJF, 1995, Hidden Secrets of the Microscope, illustrated lecture to British Association, Newcastle University, 1600h, 13 September. BJF, 1995, The Nature of Innovation, Biologist, 42 (5): 236-238, November. BJF, 1996, How Science Really Happened (lecture to Eumenides), Godmanchester, Cambridge, 1930h, 15 January. BJF, 1996, The Nature ofInnovation (reprinted from Biologist, 1995, 42 (5):236-238), University of Hong Kong: School of Research Studies Newsletter, 3 (5): 1-4, January. BJF, 1996, Developing Science, a Revisionist View, Kew Science Innovation Lecture at Jodrell Lecture Theatre, Kew Gardens, 1100h, 6 March. Hopkin, Steve, 1996, [cites BJF's Images of Science in] Geoffroy, J-J, Mauriès, J-P,& Nguyen Duy-Jaquemin, M, (eds) Acta Myriapodologica, Mémoires de la musée nationale d'histoire naturelle, 169: 25-34, Paris. Wall, Wilson, 1996, publishes Brian J Ford study of chironomid chromosomes taken with Brown-type microscope [in] Chromosome Genetics, London:Chapman and Hall. Deutsch, Daniel, 1996, Brownian Motion, now you see it, now you don't, [discusses BJF's research, in] Proceedings of the Royal Microscopical Society, 31(3): 222-227. BJF, 1996, Confirming Robert Brown's Observations of Brownian Movement (see also original submission as Microsoft Word document, Proceedings of the Royal Microscopical Society, 31 (4): 316-321. Wormald, Mark, 1996,cites BJF's Revealing Lens (1973) and Single Lens (1985) inMicroscopy and Semiotic in Middlemarch, Nineteenth CenturyLiterature, 50: 501-510. Cooke, Peter, 1996,cites BJF in Review of Chemical Microscopy, Analytical Chemistry, 68 (12): R333-378. BJF, 1997, Lecture at Padova University, Earliest days of the Optical Microscope,1530h, 2June. Jones, D, 1997, [cites BJF on microscopy in] Microscopes Down the Centuries, 8pp, June. BJF, 1997, Thediscovery of Brownian movement, illustrated lecture, Dow Microscopy Seminar, Michigan, 1200h, 23 October. Jones, David, 1998, cites BJF's history of microscopy, Biologist 45(1): 41-43, February. BJF, 1998, Where science really came from, address to South Cambridgeshire Rotary, Cambridge, 1330h, 2 March. Jones, D., 1998, 18th Century and 19th century Microscopes reappraised [cites BJF,1989] Microscopy and Analysis, 64: 9-11, March. Gold, Herbert, 1998,reports forthcoming BJF article in Scientific American, Journal of the Microscopical Society of Southern California, 3(3): 29, March. BJF, 1998, The Earliest Views, Scientific American (American edition), 278(4): 50-53, April. BJF, 1998, The Earliest Views, Scientific American (British edition), 278(4): 42-45, April. BJF, 1998, Frühe Mikroskopie, Spektrum der Wißenshaft: 68-71, June. (German translation from Scientific American). BJF, 1998, Las primeras observaciones, Investigacion y Ciencia, 261: 20-23,June. (Spanish translation from Scientific American). BJF, 1998, Nauka Wobrazach W Powigkszeniu, -Swiat Nauki, 6 (82): 48-51, June. (Polish translation from Scientific American). BJF, 1998, Premières images au microscope, Pour la Science, 249: 10-13,July. (French translation from Scientific American). BJF, 1998, Le prime immagini al microscopio, Le Scienza, 30 July. (Italian translation from Scientific American). Carmichael, Stephen, 1998, Were the first Microscopes really that Good? MicroscopyToday, 98-5: 3. BJF, 1998, [in] Scientific American (Chinese edition), 7: 40-43, July. (translation from Scientific American). BJF, 1998, [in]Scientific American (Japanese edition), 7: 72-75, July. (translation from Scientific American). Loro, B., 1998, (quotes BJF research in) Photography with microlenses, Journal of the Microscopical Society of Southern California, 3 (7):127-131, July. BJF, 1998, Le prime immagini al microscopio, Le Scienze, 360: 88-91,August. (Italian translation from Scientific American). Anon, 1998, announcement, Brian J Ford to lecture on How the Microscope was Born, Tuesday 1 December 1998, London: Royal Institution, programme booklet. BJF, 1998, How the Microscope was Born, (presentation) London: Royal Institution discussion evening, 1 December, 1800-1900h. Bianchi, Constantino,1999, (editor) includes BJF images of erythrocytes and staminalhairs, with microscopes by Brown and Leeuwenhoek, in Vedere è Sapere, CD-ROM con Memovisus,Milano: Carlo Erba OTC, April. BJF, 1999, The earliestdays of the microscope [chapter in] Yearbook of Science andthe Future 2000, ISBN 0-85229-702-5, Chicago: EncyclopediaBritannica, in press. BJF, 1999, Pioneeringmicroscopists and their simple microscopes, lecture toPacific Congress of American Chemical Society, Los Angeles,1130-1200h, 7 October. BJF, 1999, How Robert Brown observedBrownian Movement, lecture to Southern CaliforniaMicrosopical Society, Beverley Hills, 2000-2130h, 13 October. Prescott, Lansing;Harley, John, and Klein, Donald, 1999, cite BJF books andScientific American paper, 1998 (q.v.) in Microbiology:15, New York: WCB McGraw Hill. Hirsch, D. L., 1999,report of BJF presentation on Brownian movement, Journal ofthe Southern California Microscopical Society, 4 (10):210. BJF, 1999, A Thousandyears of Science, millennium lecture to Society for theApplication of Research, Churchill College Cambridge, 2030-2200h,6 December. BJF, 2000, The earliest days of the microscope[chapter in] Yearbook of Science and the Future 2000, ISBN0-85229-702-5, Chicago: Encyclopaedia Britannica, pp 192-209. BJF, 2000, Recreating the Origins of Modern Biology,120th Anniversary and Millennium Lecture, ManchesterMicroscopical Society, University of Manchester Medical School.1900-2100h, 17 February. BJF, 2000, Eighteenth Century Scientific Publishing, [chapterin] Thornton and Tully's Scientific Books, Libraries andCollectors, ed. Andrew Hunter: 216-257, London: Quaritch,March. BJF, 2000, Chairman's address to A Century of Geneticsconference, London: History Network of the Institute of Biology,8 May. BJF, 2000, The Amateurs who Give us Science(seminar), London: Institute of Cultural Research, 1430-1630h, 27May. BJF, 2000, Home-made microscopes (videopresentation) Inter Micro 2000, Chicago: McCrone Research Institute, 27 June 1230-1250h. BJF, 2000, Tracing the Roots of Modern Bioscience,illustrated lecture, Georgia Microscopical Society, Atlanta:Fernbank Science Center, 1900-2000h, 27 September. BJF, 2000, Revelations of the First Microscopes, illustrated lecture, New YorkMicroscopical Society, New York: American Museum of NaturalHistory, 1900-2000h, 28 September. BJF, 2000, The microscope and the birth of bioscience,Cavendish Laboratory seminar, University of Cambridge,1430-1530h, 27 October. BJF, 2001, The Royal Society and the Microscope, Notes and Records of the Royal Society, 55 (1): 1-25, January. Sandner, A., Sosnowski, C., Schaeffer, H., and Lacy, D., 2004, include Brian J Ford pictures of Robert Brown research [in] Science 10: 251 C1.10, p 305 fig C3.10, Toronto: Addison-Wesley Pearson. BJF, 2004, How the Pioneer Microscopists Viewed their Specimens, illustrated lecture to joint meeting of the Quekett and Postal Microscopical Society Hayling Dene Centre, Penkridge, Staffordshire, 1400-1500h, 11 September. BJF, 2004, The Birth of Microscopy, invited opening lecture to: Biohistory, International Conference on Contemporary Technologies for the History of Microscopy, 1430-1515h, Università degli Studi Dipartimento di Biologia, via Golgi, Milano. BJF, 2004, The single lens microscope as an instrument of discovery in nineteenth century science, closing lecture to Biohistory, International Conference on Contemporary Technologies for the History of Microscopy, 1215-1250h, Stazione Zoologica Anton Dohrn, Villa Comunale, Naples. Damour, T., Darrigol, O., Duplantier, B. & Rivasseau, eds., 2006, discuss Brian J Ford on Brownian Motion [in] Brownian Motion, "Diverse and Undulatng", Einstein 1905-2005 Seminar, Progress in Mathematical Physics 47: 201-293, Birkäuser Verlag, Basel. Krehl, Peter, 2007, publishes Brian J Ford studies of Brownian motion [in] History of Shock Waves, Explosions and Impact - A Chronological and Biographical Reference, Heidelberg: Springer-Verlag, Heidelberg (in press). BJF, 2007, Enlightening Neuroscience, Microscopes and Microscopy in Eighteenth Century Neurology [chapter 2 in] Whitaker, Harry; Smith, C. U. M. & Finger, Stan, (editors) Brain, Mind and Medicine: essays in 18th century neuroscience: 29-41, Springer. Machura, Lukasz, 2008, cites BJF on Robert Brown (with photographs) in PhD thesis, Institute of Physics, University of Augsburg, Germany. Krehl, Peter, 2009, publishes Brian J Ford studies of Brownian motion [in] History of Shock Waves, Explosions and Impact - A Chronological and Biographical Reference, Heidelberg: Springer-Verlag. BJF, 2008, How Science Became Reality, Illustrated Presentation to Raffles Junior College, Singapore, 4 March. BJF, 2008, How Science became Reality, illustrated presentation, Raffles Junior High School, Singapore, 1045-1145h, 4 March. BJF, 2008, Birth of the Microscope, Open Lecture, Brabourne Lecture Theatre, Keynes College, University of Kent, Chairman Professor John Baldock, 30 May: 1800-1900h. BJF, 2009, Did Physics matter to the Pioneers of Microscopy? [chapter for] Advances in Imaging and Electron Physics 158: 27-87, Editor Professor Peter W Hawkes, New York: Academic Press. 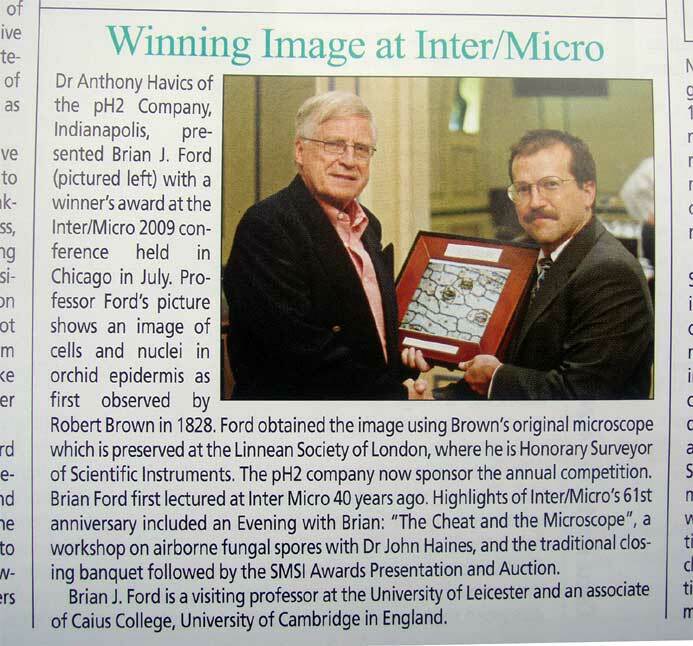 Report, 2009, Brian J Ford micrograph with Robert Brown microscope wins award at Inter Micro 2009, Microscopy and Analysis. BJF, 2009, Early Days of the Microscope, West Sussex History of Medicine Society, St Richards Hospital, Chichester, 1100-1200h, 17 October. BJF, 2010, Revolutionary Insights - the Dawn of Microscopical Investigation, illustrated lecture with videomicrographs to the Royal Society, 1330-1430h, 29 October. Wilson, Jill, 2011, Brian J Ford micrograph with Robert Brown’s microscope as image for September, Royal Microscopical Society 2011 Calendar, January. BJF, 2012, The Birth of Microscopic Vision, illustrated presentation jointly organized by the Georgia Microscopical Society, MVA Associates, and Gwinnett Technical College, 1600-1700h, 5 July. BJF, 2013, Residential course: What the Microscope Reveals, Institute of Continuing Education, Madingley Hall, Cambridge University, 15-17 March. BJF, 2013, The Birth of Microscopic Vision, illustrated lecture for Georgia Microscopical Society, Merritt College, Atlanta GA, 1930-2030h, 15 May. BJF, 2013, The first Microscopes – What could they truly reveal? invited after-dinner presentation for South Eastern Microscopy Society, Greenville SC, 1200-1240h, 23 May. BJF, 2014, Living Images from the Birth of Microscopy, Microscopy Today 22 (04): 2-5, July issue. BJF, 2014, Living Images from the Birth of Microscopy, Plenary Address to Microscopy & Microanalysis conference, Hartford Conference Center, Connecticut, 1115-1200h, 3 August. (Conference report on-line, 20 August). BJF, 2014, Critical Focus 18: Breaking the Myths of Microscopy, The Microscope 62 (2): 63-73, 2014. Heath, J. P., and Parmenter, C., 2014, Thousands Drawn to M&M (with report of Brian J Ford plenary address), Microscopy and Analysis, September/October issue: 22. Peckham, Michelle, 2017, From the President [with brief report of Brian J Ford plenary address at mmc2017 conference], InFocus, Proceedings of the Royal Microscopical Society 47: 74. Pool, Rebecca, 2017, Life through a Microscope [profile], Microscopy and Microanalysis 32: 6-8. O’Leary, Colum, 2017, [comments on "Professor Brian Ford's thought-provoking lecture"] InFocus, Proceedings of the Royal Microscopical Society 48: 64-75. BJF, 2018, The microscope of Robert Brown [in] commemorative volume for the Linnean Society of London, in press. See also: site on what Brown saw and paper on Brown's microscopical experiments.